What’s big and loud and has a ferocious appetite? 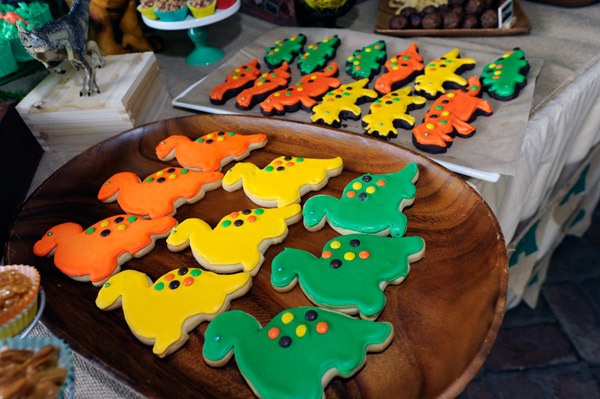 A bunch of preschoolers at a dinosaur party, that’s what! After being in the front row for his sister’s pretty-as-a-picture Alice in Wonderland party and his big brother’s bold and brash Lego bash in the weeks leading up to his own birthday, my youngest child Will had big plans for his special day. Dinosaur sized plans, in fact. 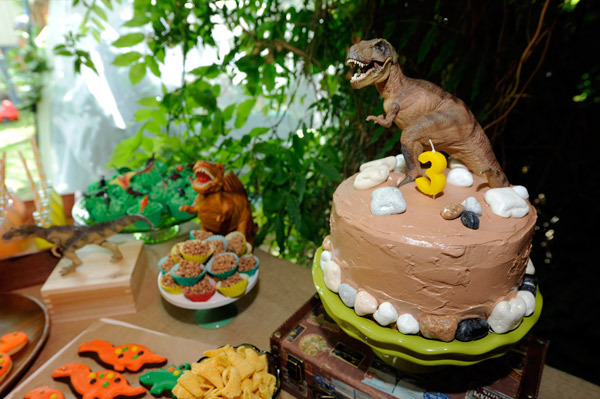 And of course, I came to the party in a T-Rex sized way. 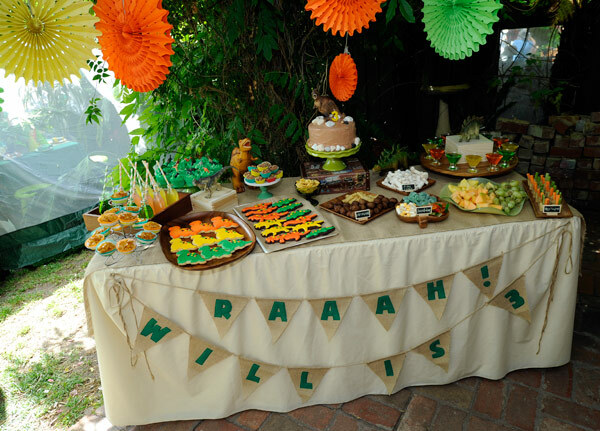 I wanted an earthy, Jurassic-like jungle feel for Will’s party, so searched high and low for wooden plates and platters to use on the sweets table, then raided my mum’s kitchen for lots of green 70s glassware. In the end, I was still short a platter or two, so just covered white tableware with brown paper. Problem solved! Hessian swathed over the sweets table lent just the right rustic air, and I made a party banner from hessian and dark green felt to decorate the front of the table too, threading it onto thick jute found at Spotlight. 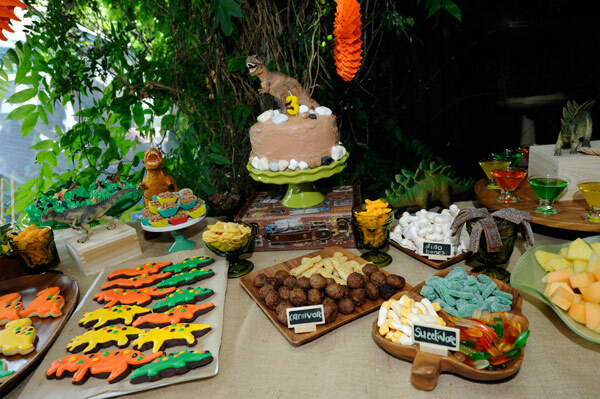 I’ve never bothered with menu tags on the sweets table at any of my parties before, but this time I made an exception, even though most of the guests didn’t know how to read! I couldn’t help myself after finding these cute blackboard tags at Occasion By Design. 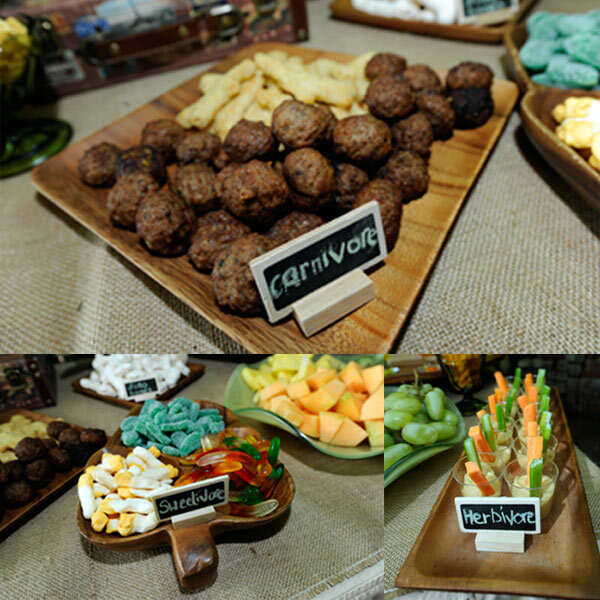 I tagged one “carnivore” for a platter of tiny meatballs and dinosaur-shaped chicken nuggets, one “herbivore” for little pots of hummus and vegie sticks (and in my party colours of green, orange and brown too) and one “sweetivore” for a platter of mint leaves, grubs and gummy worms. 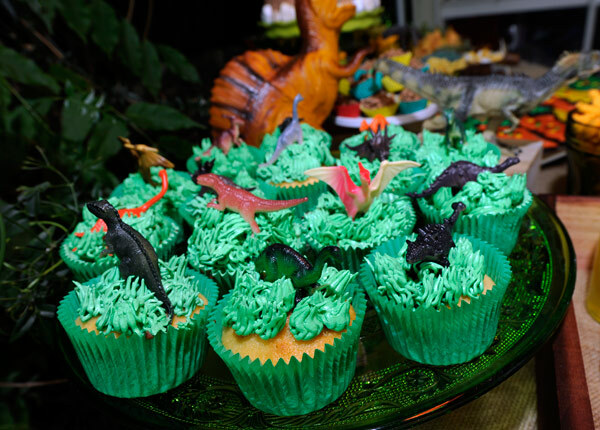 Other goodies included a fruit platter, swamp jellies, bone-shaped meringues, caramel popcorn, two types of dinosaur cookies that my elder son proudly helped ice, and vanilla cupcakes topped with buttercream “grass” and little toy plastic dinosaurs. 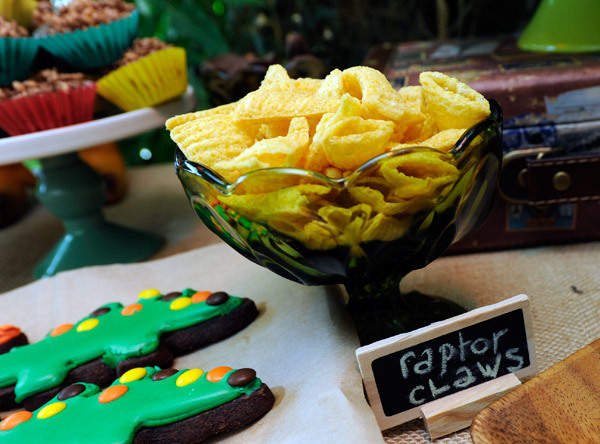 I also included, for their perfect eco-rustic earthy vibe, two once-common party treats that seem to have fallen out of favour in recent years – chocolate crackles (I make mine with real chocolate rather than copha) and honey joys. I’m not sure who was more excited to see these – the kids or the parents! The birthday cake was a scrumptious triple layered chocolate number filled with ganache and chocolate-flavoured Swiss meringue buttercream. Believe it or not, all those rocks on top are edible! They’re candy-coated chocolate. The kids couldn’t believe it! I hunted for months for a green cake stand to hold the birthday cake and almost gave up before finding this ruffle-edged one online at Amazon. It was perfect! 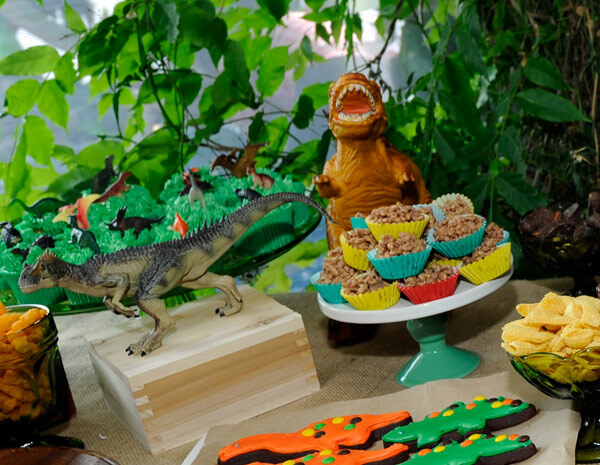 The smaller green-footed cake stand used for the chocolate crackles came from The Wooden Crate and the large green glass cake stand used for the cupcakes from Bon Bon Boutique. 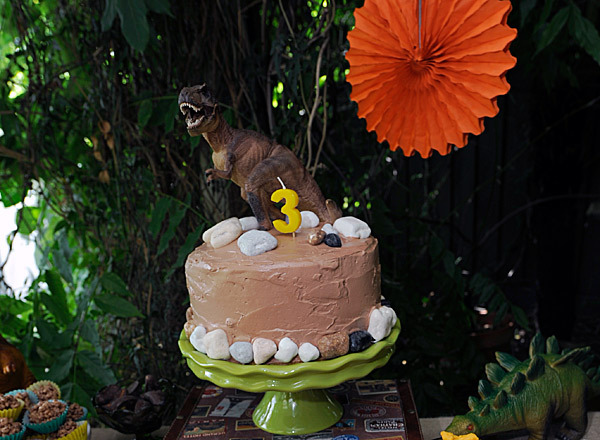 The fierce T-Rex atop the cake and most of the other dinosaurs used to adorn the party tables came from my favourite toy shop in all the world, Tree Top Toy Shop in the inner Melbourne suburb of Brunswick. 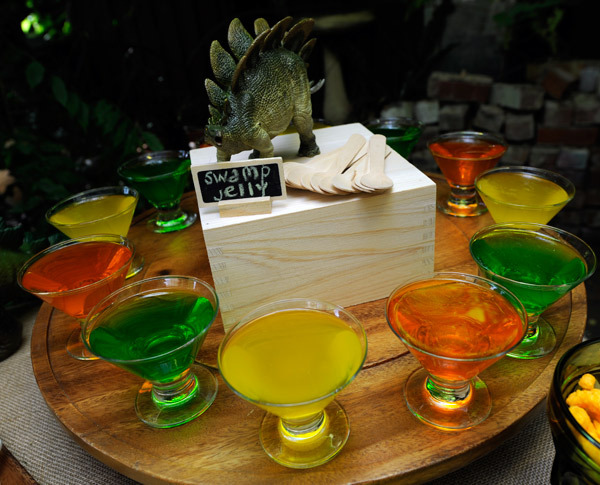 I’m a big stickler for kids always sitting down to eat, and my parties are no exception, so I created a base tent for my little paleontologists to have their refreshments in. 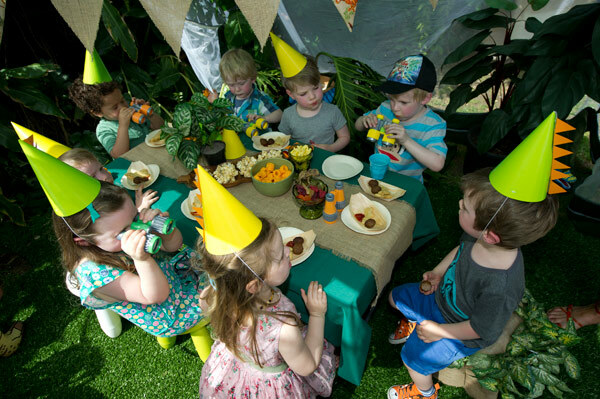 We filled it with lots of ferns and palm trees for a jungle feel, and hid big inflatable dinosaurs amongst the foliage. 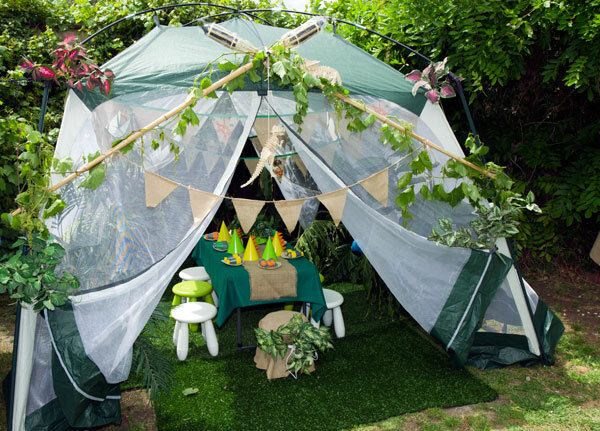 My mother-in-law helped me make ten metres of bunting from hessian and dino fabric to hang inside, while two bamboo torches framed the doorway for another ooh-we’re-lost-in-the-jungle touch. My mum pitched in too, decorating a stool especially for the birthday boy to sit on. Inside, a kid-sized table was set with wooden eco ware from Occasion by Design, with hot foods served inside darling little bamboo boat-shaped plates. Each place was also set with a party hat (plain hats made more dinosaur-like with a bit of coloured card and a glue stick by yours truly) and a pair of binoculars. 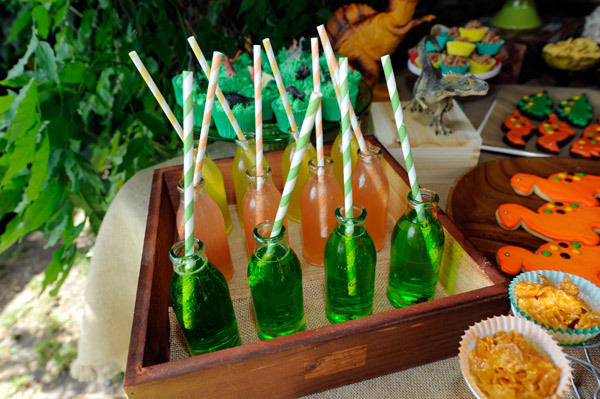 The kids used these after their feast for a dinosaur egg hunt. I grabbed several bags of pull-apart plastic eggs at Easter (yes, that’s how far back I’ve been planning this one!) 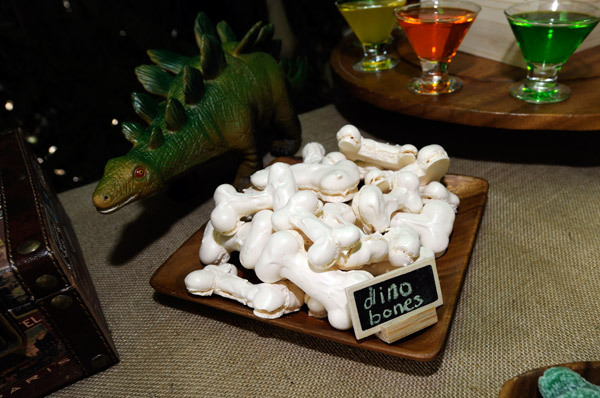 and put a small dinosaur toy inside each one before hiding them in the garden. It was hilarious watching the little ones peering through their binoculars with total seriousness as they hunted around the garden for dinosaur eggs. 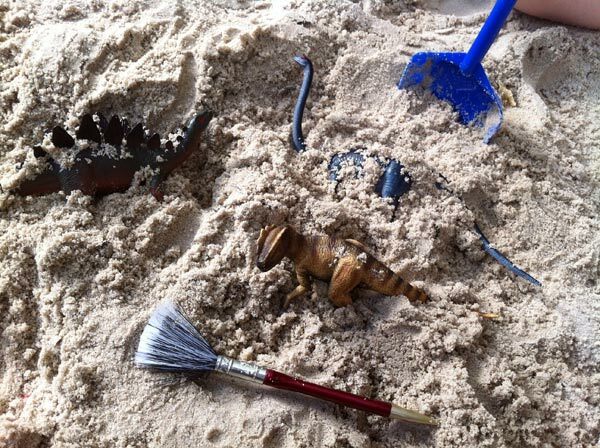 I also filled the sandpit with dinosaur toys found for $2 a piece at Big W, then gave each kid a shovel and a paint brush so that they could dig them up. They had so much fun. 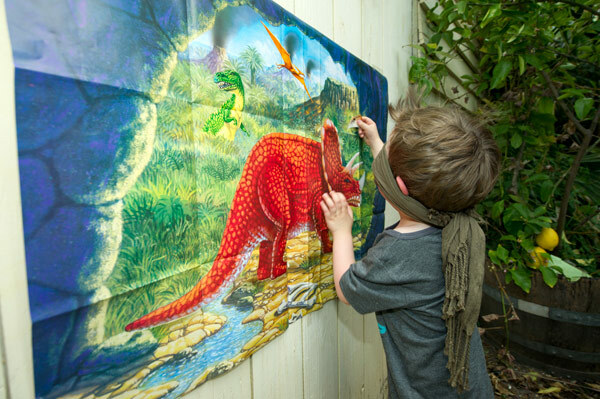 Then there was Dinosaur, Dinosaur, T-Rex (a Jurassic take on duck, duck, goose), and Pin the Horn on the Stegasaurus, using a game found on eBay, while Spotify provided the perfect dinosaur-themed soundtrack. 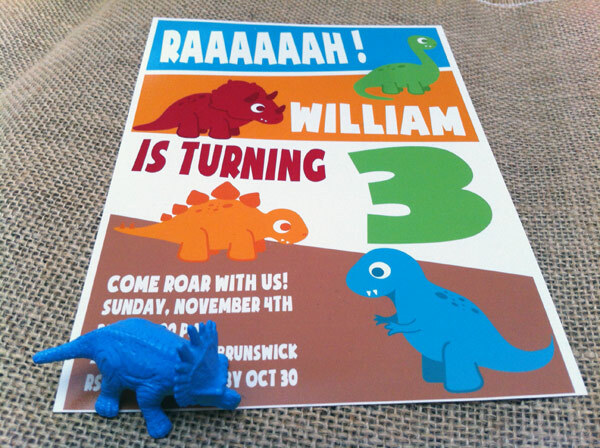 Here’s the cute invitation that kicked things off. 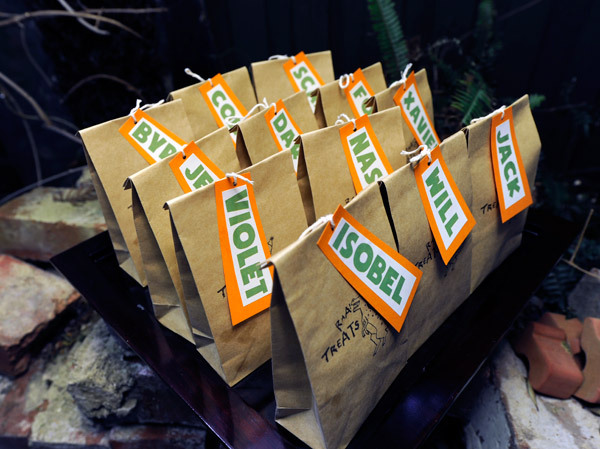 It came from Etsy store Sweet Pea Shirts and they even kindly told me which font they’d used so that I could replicate it on my home-made party banners and goody bag tags.